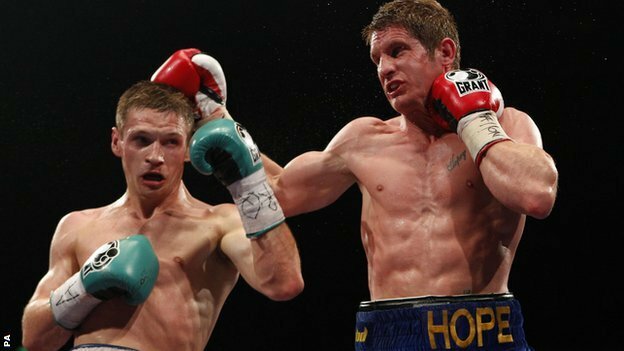 Welshman Kerry Hope's reign as European middleweight champion is over as Poland's Grzegorz Proksa took revenge in Sheffield. Hope, 30, outworked Proksa to claim an upset in March, but was unable to repeat the effort. The Merthyr Tydfil fighter's bout was ended by a Proksa right hook in the eighth round. Proksa's professional record is now 28 wins, with 21 inside the distance, and one defeat, while Hope falls to 17-4. Like March's contest, the rematch at the Motorpoint Arena was blood-stained as Proksa opened up a cut above Hope's right eye in the first round. A thudding overhand left drove Hope towards the ropes in round two, but he worked his way back in the next session, connecting with a left hook behind the challenger's ear. A right hook into a left upper cut marked Proksa's most eye-catching work of round four and began a pleasing back and forth throughout the middle rounds as both men showed scant regard for defence. With little to choose between the fighters halfway through the scheduled distance, Proksa assumed the ascendancy in seven, landing a succession of clean head shots. The end was spectacular, Proksa bursting through Hope's defences with a vicious right. The champion got back to his feet, but referee John Keane ruled he was in no condition to continue. Hope's fellow Welshman Gavin Rees stopped Derry Mathews to retain his European lightweight title.